Jason La Canfora has reported that Washington Redskins center Spencer Long has undergone a minor knee scope and will miss the final two weeks of the preseason. Long finished 2016 ranked 29th out of 72 qualified centers with a 69.6 overall grade. He struggled as a run blocker last year, earning a run blocking grade of just 54.0 (the 11th lowest in the league); however, he performed well in pass protection, ranking ninth with an 82.6 pass blocking grade. Long has been clean in pass protection so far this preseason but run blocking continues to be an issue, evident by his 41.7 run blocking grade against the Green Bay Packers. 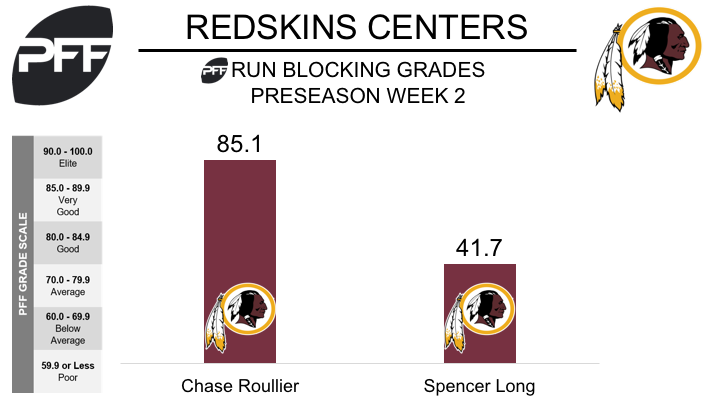 Long’s absence will likely make way for sixth round rookie Chase Roullier, who has been impressive in preseason action. Roullier has played 56 snaps in two preseason games, and has achieved PFF overall grades of 73.8 and 81.7, ranking eighth and third among all centers in the league, respectively. His run blocking grade of 85.1 against Green Bay was the highest among all centers in the league.